Jodorowsky's Dune is a 2013 American-French documentary film directed by Frank Pavich. The film explores cult film director Alejandro Jodorowsky's unsuccessful attempt to adapt and film Frank Herbert's 1965 science fiction novel Dune in the mid-1970s. In 1971, the production company Apjac International (APJ) headed by film producer Arthur P. Jacobs optioned the rights to film Dune. However, Jacobs died in 1973 before a film could be developed. In December 1974, a French consortium led by Jean-Paul Gibon purchased the film rights from APJ, with director Alejandro Jodorowsky set to direct. Along with French producer Michel Seydoux, Jodorowsky proceeded to approach, among others, Virgin Records with the prog rock groups Tangerine Dream, Gong and Mike Oldfield before settling on Pink Floyd and Magma for some of the music; artists H. R. Giger, Chris Foss and Jean Giraud for set and character design; Dan O'Bannon for special effects; and Salvador Dalí, Orson Welles, Gloria Swanson, David Carradine, Mick Jagger, Udo Kier, Amanda Lear and others for the cast. Jodorowsky intended his son Brontis, 12 years old at the start of pre-production, to star as Paul Atreides. Herbert traveled to Europe in 1976 to find that $2 million of the $9.5 million budget had already been spent in pre-production and that Jodorowsky's script would result in a 14-hour film ("It was the size of a phone book", Herbert later recalled). Jodorowsky took creative liberties with the source material, but Herbert said that he and Jodorowsky had an amicable relationship. After two and a half years in development, the project ultimately stalled for financial reasons since $5 million was still missing to round off the $15-million total budget. 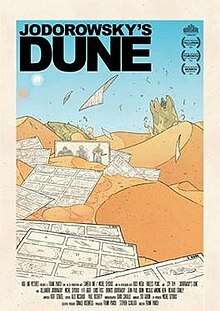 After the film rights lapsed in 1982, they were purchased by Italian filmmaker Dino De Laurentiis, who eventually released the 1984 film Dune, directed by David Lynch. The film notes that Jodorowsky's script, extensive storyboards and concept art were sent to all major film studios, and argues that these inspired later film productions, including the Alien, Star Wars and Terminator series. In particular, the Jodorowsky-assembled team of O'Bannon, Foss, Giger and Giraud went on to collaborate on the 1979 film Alien. "It was a great undertaking to do the script," Jodorowsky says in the film. Speaking of Herbert's novel, he says: "It's very, it's like Proust, I compare it to great literature." The project was officially announced in May 2011. Director Pavich filmed an extensive series of interviews with the principal players involved in the failed 1970s adaptation, shooting in France, Switzerland, the United Kingdom, and the United States. Jodorowsky's Dune premiered at the Director's Fortnight at the 2013 Cannes Film Festival in May 2013. Sony Pictures Classics acquired the North American distribution rights to the film in July 2013, and later announced a theatrical release date of March 7, 2014. The film was released on DVD and on-demand on July 8, 2014. The film has received critical acclaim. Variety called it a "mind-blowing cult movie" and said that director Pavich "happens upon a compelling theory: that even in its still-born form, the film manifested the sort of collective [consciousness] that Jodorowsky was trying to peddle through its plot, trickling down to influence other sci-fi films that followed". The Hollywood Reporter declared the "entertaining documentary makes the case for this overblown epic as a legendary lost masterpiece". Entertainment Weekly named Jodorowsky's Dune as one of its 10 Best Movies of 2014.
Review aggregation website Rotten Tomatoes gave Jodorowsky's Dune a 98% "Certified Fresh" rating based on reviews from 108 critics. The site's consensus states: "Part thoughtful tribute, part bittersweet reminder of a missed opportunity, Jodorowsky's Dune offers a fascinating look at a lost sci-fi legend." Metacritic gives the film a 79/100 rating based on 31 critics, indicating "generally favorable reviews". ^ "Jodorowsky's Dune (12A)". British Board of Film Classification. January 14, 2015. Retrieved January 14, 2015. ^ "Jodorowsky's Dune". Box Office Mojo. Retrieved August 28, 2014. ^ a b "Dune: Book to Screen Timeline". Duneinfo.com. Archived from the original on May 17, 2011. Retrieved February 15, 2019. ^ Jodorowsky, Alejandro (1985). "Dune: Le Film Que Vous Ne Verrez Jamais (Dune: The Film You Will Never See)". Métal Hurlant. DuneInfo.com. Archived from the original on April 29, 2011. Retrieved February 8, 2014. ^ a b Nashawaty, Chris (December 12, 2014). "10 Best/5 Worst Movies of 2014". Entertainment Weekly (1341). Retrieved December 8, 2014. ^ Scanlon, Paul; Michael Cross (1979). The Book of Alien. London: Titan Books. ISBN 1-85286-483-4. ^ Kit, Borys (May 12, 2011). "Alejandro Jodorowsky's Dune Will Finally Hit Screens". The Hollywood Reporter. Retrieved February 10, 2014. ^ Cecchini, Mike (August 25, 2013). "Jodorowsky's Dune Gets a Release Date From Sony". DenofGeek.us. Retrieved December 8, 2014. ^ Debruge, Peter (May 19, 2013). "Cannes Film Review: Jodorowsky's Dune". Variety. Retrieved May 19, 2013. ^ Dalton, Stephen (May 19, 2013). "Jodorowsky's Dune: Cannes Review". The Hollywood Reporter. Retrieved May 19, 2013. ^ "Jodorowsky's Dune". Rotten Tomatoes. Flixster. Retrieved January 14, 2015. ^ "Jodorowsky's Dune". Metacritic. CBS Interactive. Retrieved June 3, 2014. ^ "Best of 2014: Film Critic Top Ten Lists". Metacritic. ^ "The Best Movies of 2014". Asbury Park Press. ^ "We Pick the Year's 5 Most Intriguing Documentaries". Wired. ^ "The top 10 films of 2014, as decided by Globe film critic Liam Lacey". The Globe and Mail. ^ "Neil Rosen's Top 10 Best Films of 2014". NY1. ^ "Mike's Picks for The Best & Worst Films of 2014". MediaMikes.com. ^ "Angry Nerd's The 10 Most Underrated Movies of 2014". Wired. ^ "Top 10 Best Movies". Time. ^ "The Top 10 Best Films of 2014". Cincinnati City Beat. ^ "Top 10 films of 2014: in search of originality". The Japan Times. ^ "Top 10 movies of 2014 include Birdman, Whiplash, The Lego Movie". Tampa Bay Times. ^ "2014's best films". San Francisco Examiner. ^ "10 Best/5 Worst Movies of 2014". Entertainment Weekly. ^ "Erik's 15 Favorite Movies of 2014". Portland Mercury. ^ "10 Movies manage to Glitter Amid Dark Year at Multiplex". Portland Mercury. ^ "Verniere: Here's my list of year's best films". Boston Herald. ^ "Best Movies of 2014". The Commercial Appeal. ^ "Top 10 Movies of 2014". Fort Worth Weekly. ^ "Brian Miller's 10 Favorite Movies of 2014". Seattle Weekly. ^ "The best movies of 2014: Boyhood, Force Majeure, Selma and more". Washington Post. ^ "A. O. Scott's Top 10 Movies 2014: Boyhood and More". The New York Times. "Doomed Dune Was Generations Ahead of Its Time". NPR. March 22, 2014. Retrieved June 29, 2014. O'Connell, Max (March 18, 2014). "Jodorowsky's Dune Director Frank Pavich on 2,000 Defecating Extras and How Dune Became Part of the Cosmic Consciousness". Indiewire. Retrieved August 18, 2015. Corliss, Richard (March 20, 2014). "Jodorowsky's Dune: A Great Dream of Movie Madness". Time. Retrieved October 13, 2015.